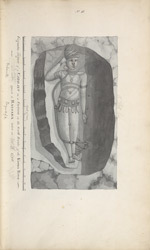 Watercolour drawing dated 1796, of a colossal figure of Vishnu Narayana at Undavalli, in Andhra Pradesh, from an album of 56 sheets of drawings (60 folios) mainly of miscellaneous architecture and sculpture in the Deccan and S. India, dated 1793-1806. Some drawings are by MacKenzie himself, others by his draftsmen, including C. Ignatio. At Undavalli, overlooking the south bank of the Krishna River, there are some rock-cut temples assigned to the seventh-eightht century, Eastern Chalukya rulers. The cave are plain and massive with unrelieved squat columns. The most impressive sanctuary is the 'triple-storeyed cave' which consists of three columned halls one set back from the other. In the hall of the uppermost level there are some carved panels, mostly later additions. This drawing depicts the panel depicting Vishnu reclining on the serpent Ananta.